Dark and menacing. Even the label looks a dark contrasting image. Pours dark red. Almost black. Old English fruit and caramel on the nose. Slight malts. Not the normal but tees I get from dark beers. Some hops and more bitterness. Toffee like. Almost cinder toffee. Decent. 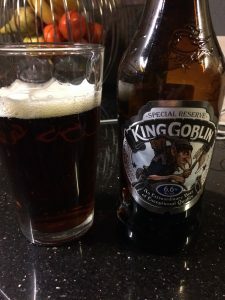 This entry was posted in beers and tagged goblin, wychwood. Bookmark the permalink.